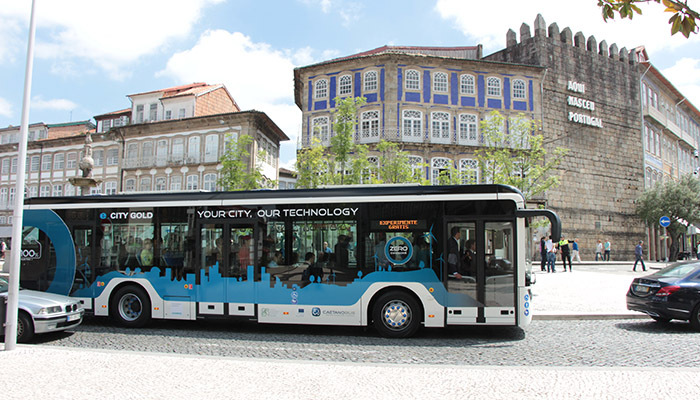 After its presentation in June, the new Caetano 100 % electric city bus will make its first stop at the Green Weekend. This event will take place between 4th and 5th June in Guimarães, and includes a set of activities for the European Green Capital 2020. With the motto Your City, Our Technology, e.Gold City will make the first kilometers in Guimarães. Zero emissions, silent and reduced operating cost are the main features of this ecofriendly bus. The official opening of the Green Weekend is scheduled for Saturday at 10 a.m., in a session attended by the Mayor of Guimarães, Mr. Domingos Bragança. After the official ceremony, the guests are invited to an experimental bus route. In the months to come, e. City Gold will also be on demonstration in several Portuguese cities, such as Coimbra, Lisbon, Braga and Oporto.